(Left to right) Winter Haven Student Government Association Secretary Kieran Sequin, Vice President Mikka Mendoza, and President Gonzalo Gutierrez. 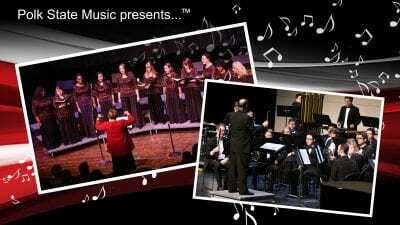 Photo by Tom Hagerty, Polk State. 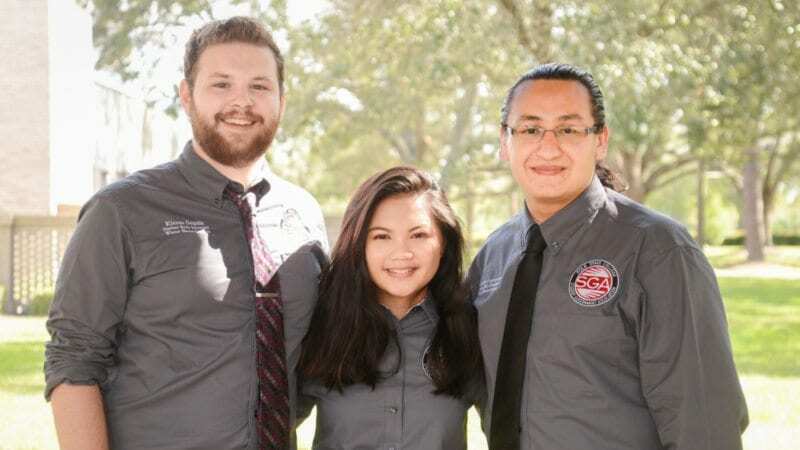 The Student Government Association (SGA) provides Polk State College students with an active voice in administrative and legislative matters concerning the student body. The SGA serves as the liaison between students and administrators, organizes campus activities, represents students in state and national organizations, and provides advocacy on legislative issues. Officers are elected during the spring semester and serve one-year terms. Winter Haven SGA meetings are open to all students Tuesdays at 2 p.m. in WLR 106. Connect with Winter Haven SGA on Facebook @WHSGA and Twitter @PSCWHSGA, and via email at psc.whsga@gmail.com. 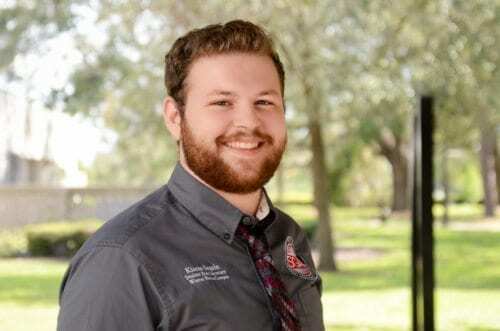 The first question people typically ask the Polk State Winter Haven Student Government Association officers when they meet is whether they are interested in going into politics. “People assume we all want to become politicians, but we don’t,” Secretary Kieran Sequin said. “We’re not interested in politics, we’re interested in community,” President Gonzalo Gutierrez said. 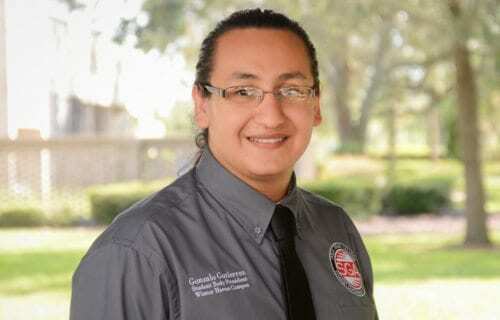 Gutierrez saw a need for more student involvement when he was a student at Polk State Chain of Lakes Collegiate High School. The first-generation Mexican-American student graduated in 2015 with his high school diploma and Associate in Arts degree. “It was the affordability and access to a great education that kept me here,” Gutierrez said of continuing his education at Polk State. He’s working on a bachelor’s in Business Administration. He plans to use that as a base for a career in higher education administration, he said. By being a voice and providing resources for the student body, the SGA helps students discover what they are passionate about and how to be successful in not only college, but also in the community as servant leaders, Gutierrez said. Gutierrez’s peers describe him as presidential and a “brainiac” who is persistent and successful. Vice President Mikka Mendoza has fallen in love with being a voice for students. 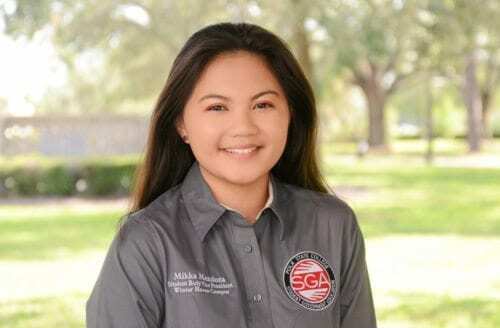 Mendoza is from the Philippines and started her journey at Polk State as a dual-enrolled student while attending Winter Haven High School. She began volunteering with The Eagleteers to fill the community service requirement for a scholarship. It’s there that she discovered her passion for helping others, she said. 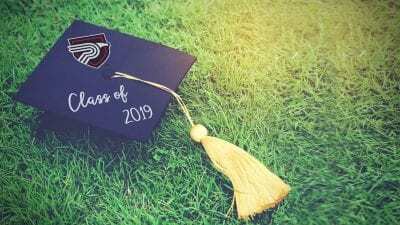 When she was a junior in high school, she transferred to Polk State Chain of Lakes Collegiate High School, where she graduated with her high school diploma and Associate in Arts degree. “I was ready to move to a university but realized that I had support here that I wouldn’t have had if I moved away,” Mendoza said. She’s working on a bachelor’s degree in Business Administration and wants to pursue a career in the nonprofit sector. She plans to continue her education at Rollins College. Mendoza’s peers describe her as a calculated, knowledgeable “walking calendar” who is dedicated, inspirational, and motivational. For Secretary Kieran Sequin, Polk State was his college of choice because of its affordability and close proximity to home. On his first day of classes, he inquired about the SGA. While Sequin was searching for the Student Activities and Life Office (SALO), a club rush was taking place, where he met Gutierrez at the SGA table and joined so that he could get involved. Sequin wants students to know that the SGA is not a joke. Sequin is working on his Associate in Arts degree and plans to transfer to Florida State University to study Criminology. He aspires to work in federal law enforcement. As secretary, he’s responsible for both legislative and fiscal issues that affect students and campuses. “I like having the ability to do something more – to have a voice and be part of brainstorming ideas that will positively impact the College and student life,” Sequin said. That’s what Historian Jamie Cooper enjoys most about the SGA, too. She was born and raised in Polk, but moved to Dallas, Texas, when she was 13 for a few years. When she returned to Polk, she couldn’t catch up in school and dropped out. She went to Penn Foster, an alternative school in Lakeland, where she was able to achieve her high school diploma. She wanted to get involved, but felt like a “free roaming soul” until she met a former SGA vice president who introduced her to Gutierrez and Mendoza. “Growing up, I was always the child who didn’t feel like she had a voice. I want to be a voice for those people,” Winter Haven SGA Historian Jamie Cooper said. As historian, she’s responsible for managing social media and creating event fliers, among other things. Cooper’s peers describe her as creative, artistic, and hard-working. Like his peers, Jurisprudence Robert Keratt came to Polk State because it was affordable and close to home. When he was in fifth grade at Elbert Elementary School, he received a scholarship from the Polk State College Foundation. When he made it to Polk State, he attended his first SGA meeting with Sequin and was immediately hooked. As jurisprudence, he’s responsible for making sure meetings run in a smooth, timely manner, “and that Gonzalo doesn’t make this into a dictatorship,” he joked. He’s working on an Associate in Arts degree and plans to go to Rutgers University to study sports management before returning to his hometown in New Jersey. Keratt’s peers describe him as a strong, intelligent problem solver who is passionate, energetic, and loyal. Now he can attest that that’s not the case. “We want to bring the students together as a community,” Winter Haven SGA President Gonzalo Gutierrez said. But, like her peers, the affordability of Polk State’s quality education made it the best option. She wanted to attend Embry Riddle but, despite having scholarships, it was financially out of reach. 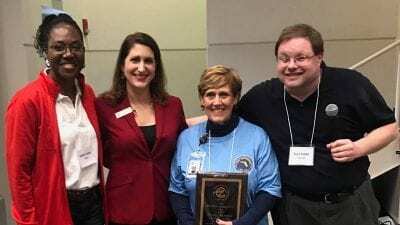 She wanted to make the most of her time at Polk State and the SGA reminded her of The Junior Reserve Officer Training Corps. Patton’s peers describe her as a friendly, trustworthy go-getter who is intellectual and full of personality. “We’re like a family,” Patten said. “We want to bring the students together as a community,” he said.